Literary Classics: The Claimed earns the Literary Classics Seal of Approval. 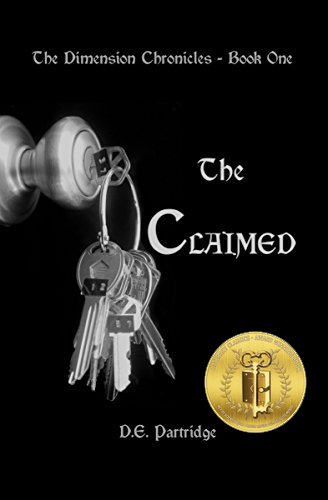 The Claimed earns the Literary Classics Seal of Approval. Grace lives in an orphanage where she’s essentially a loner. She is fully aware that her chances of being adopted are slim, as only the younger children tend to find forever homes. But then one day a woman named Jerra appears, intent upon removing Grace from the orphanage, but not under circumstances Grace could ever have imagined. Grace soon discovers that she possesses latent talents that Jerra and her colleagues intend to help her discover and hone. Quite unexpectedly, and with little warning, Grace finds herself in an alternate dimension which is entirely unlike anything she has ever known. Author D.E. Partridge’s The Claimed, is a wildly imaginative and thoroughly engrossing tale of one young girl’s journey of self-discovery in a magical realm. Full of fascinating plot twists, with other-worldly dimensions and alternate realms, this book will keep readers enthralled from the first to the very last page. Recommended for home and school libraries, The Claimed has earned the Literary Classics Seal of Approval.